The dodgems, or bumper cars, as they are known in some parts of the country, are easily the most popular funfair ride available for events. 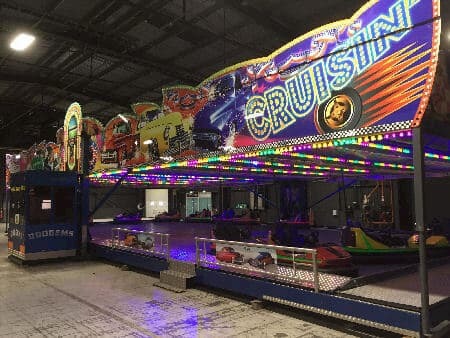 Like most things in life, there is a vast range of rides available for hire, so you have a number of choices to make when specifying dodgems. The first option, is to determine whether you need the traditional English style dodgem track, or the more modern continental version. The difference, is that the traditional track comes totally dismantled, this allows it to be carried over obstructions, up stairs, or through narrow entrances, meaning this ride can access virtually any venue. The downside is that the set up time is easily double that of the more modern counterpart. The newer version of the ride, comes folded up onto a centre truck, this is driven into position, then folds out, in the main using hydraulic power. The ride is far quicker to set up and dismantle, tends to be more highly decorated, with better sound and lighting systems. The only real drawback, is that the ride must be driven into position, so its limited as to where it can be used. 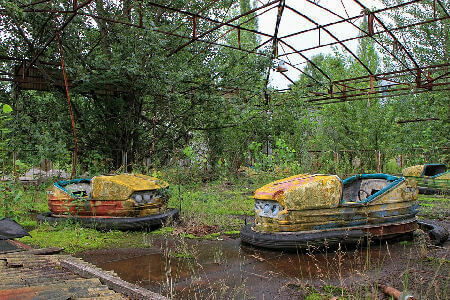 In the dark ages, before the internet was formed from the primordial cyberspace, the usual method of hiring a dodgem ride, would have been looking through the Yellow Pages, personal recommendation, or visiting a funfair and asking the ride owner there about a deal. Nowadays 10 minutes on the internet can source a multitude of rides at a vastly differing set of prices. 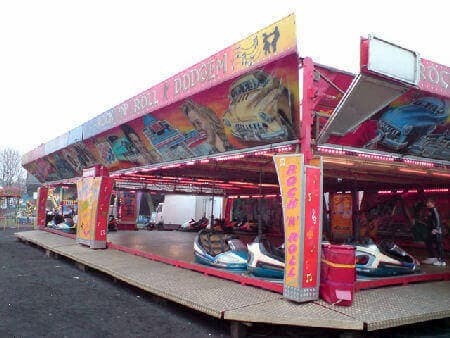 Indeed dodgem rides are being hired out for lower costs now than they were probably ten years ago. So this is great, you find dodgems online, book the cheapest ride and away you go. Sadly not, like anything else lowest price is not always the best option. There is a vast selection of dodgem rides, ranging from state of the art fabulousness, to something you would be frightened to ride, and price isnt always the main way of telling them apart. If you are dealing online, without being able to see the actual ride, there are some steps you can take to help prevent you being stuck with a lemon. First, ask for pictures of the actual ride you will be hiring, any reputable operator should be able to supply fairly hi resolution images that will give you a fell for what you are getting. Ask how many cars it comes with, 14-16 is the industry standard, yet some operators will give you a much lower price, then turn up with 5 or 6 cars. Make sure the ride comes with lights and music, again, all rides should have these, and ensure there is a top cover over the ride, and that it will be fitted, dodgems can be used in the wet, but not if the operator leaves the top covering off to save himself the work of fitting it. A good rule of thumb, would be to ignore both the highest and lowest quotes and do your research around the middle range of quotes which you should find are all fairly close. It goes without saying that the operator should be able to provide public liability insurance, but he should also send you risk assessments, fire assessments and method statements, they are all legal requirements, and if he hasnt got them then walk away. The final document you need is the ADIPS certificate, this stands for the Amusement Device Inspection Procedure Scheme, and is issued by an independent engineer when he carries out the rides annual safety inspections. If this isnt available, dont walk away, run. A few simple questions should give you a feel for how legit the guy you are dealing with is, if he cant supply something or keep promising it and it never turns up, then can you really trust him to do a professional job on the day? Remember the bitterness of poor service lingers long after the sweetness of low price fades.